4 Way 8 Amp Power Relay Board The 4 Way 8 Amp Relay Board has 4 x 12Vdc inputs that switch 4 x 8 amp single pole double throw relays. 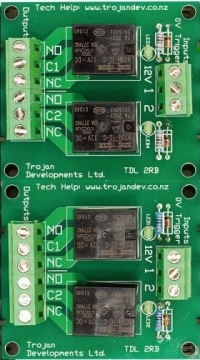 Each set of two relays can be switched from different power supplies and if only two relays are required, the board can be split into two. This unit also fits on the TDL Mounting Base system to ensure a neat and tidy installation.